Back in March, I signed up for a crafty pay-it-forward activity sponsored by Rebekah of Elizabeth Anne Designs. In exchange for receiving a small surprise in the mail from her, I agreed to offer the same to 5 others. I sent out my packages this week, and I got confirmation tonight that everyone has received them, so I can finally reveal what I made. 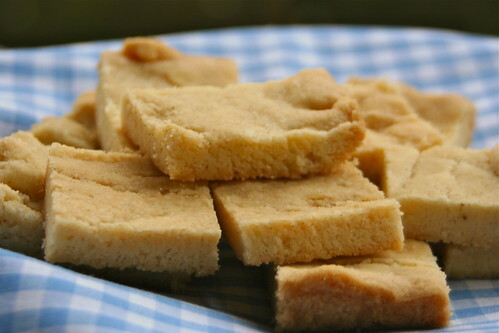 Since I've been enjoying cooking and baking so much lately, I decided to send along some easily transportable Vanilla Bean Shortbread from the May 2009 issue of Cooking Light. My healthy secret here was that I'm not really a shortbread fan, so I wasn't tempted to nosh on the leftovers. I also included jam I made from blackberries I picked last summer... we still have so much left, I was glad to have a chance to share. I packaged everything up using these precious labels. Hope you girls enjoyed the treats! "This half-oil, half-butter version yields a crisper, more delicate cookie," says Cooking Light Advisory Panelist Greg Drescher of the Culinary Institute of America. Make up to five days in advance, and store in an airtight container. 4. Place butter in a medium bowl or bowl of a stand mixer; beat with a mixer at medium speed 2 minutes or until light and fluffy. Add oil; beat with a mixer at medium speed 3 minutes or until well blended. Gradually add sugar, beating well. Scrape seeds from vanilla bean, and add seeds to butter mixture; discard bean. Add flour mixture, beating at low speed just until blended. Spoon dough into prepared pan. Place a sheet of heavy-duty plastic wrap over dough; press to an even thickness. Discard plastic wrap. Bake at 350° for 30 minutes or until edges are lightly browned. Cool in pan 5 minutes on a wire rack; cut into 32 pieces. Carefully lift foil from pan; cool squares completely on a wire rack. I got my first ever vanilla bean two weeks ago and have been saving it up for something special. It's a shame you don't care for shortbread. This looks wonderful! I'm not a shortbread fan either, but the butter and oil combination sounds pretty interesting especially since it's the overpowering butter flavour that turns me off regular shortbread. I used this recipe a few weeks ago and LOVED it! it's got great flavor and a perfect shortbread texture. My family also loved it when they had a taste. Oh, Ami! These look incredible ... I have some vanilla beans lying around so I may have to try these! That would be a lovely treat to get in the mail. I hope everyone liked it.